Dear Janie, thank you for taking the time to read and respond to my poem. I am happy to hear that my poem meant something to you. I agree that there is violence happening right now around us and we need to do something about it. Thank you again for writing such a great response. 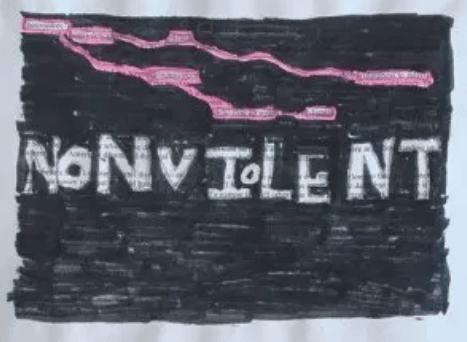 I am impressed by your poem, “nonviolence” because its short but it tells a meaning about what we have to do about the violence that is happening. To me the main message of your poem is to create a society that doesn’t have violence. I know this because of how your poem said “Rose up with dignity”. I feel like that means that the community rose above even if there was violence going on.Your poem reminds me of a poem that I once read and then I also had to write one. My poem talked about how there was violence happening on in my community and how it affects people around me. Your poem sends an important message about nonviolence because it’s actually relevant to what is happening now at this moment with all the violent going on. Thanks for your poem. I look forward to seeing what you make next. I would like you to keep on working on writing more poetry because your poem which was short but meant something spoke out to me. Calder by is licensed under a Creative Commons Attribution-ShareAlike 4.0 International License.